We proudly announce the release of CF WebUI! CF WebUI is a modern single-page web front-end for Cloud Foundry based on AngularJS and Bootstrap. 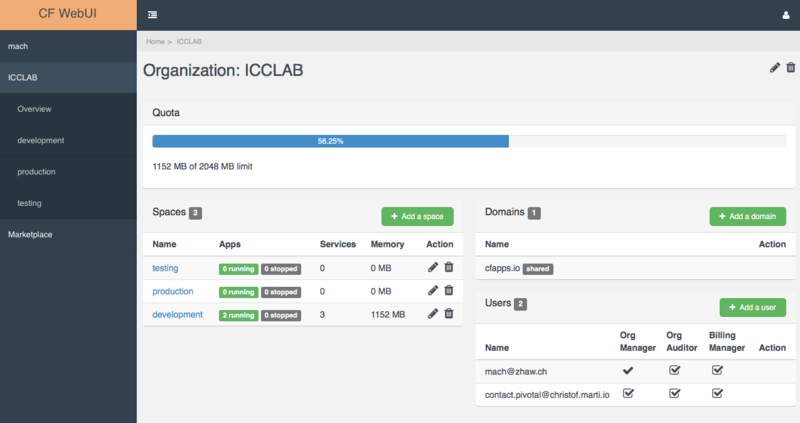 It is developed at the ICCLab as an open source alternative to commercial and proprietary web-consoles for Cloud Foundry. 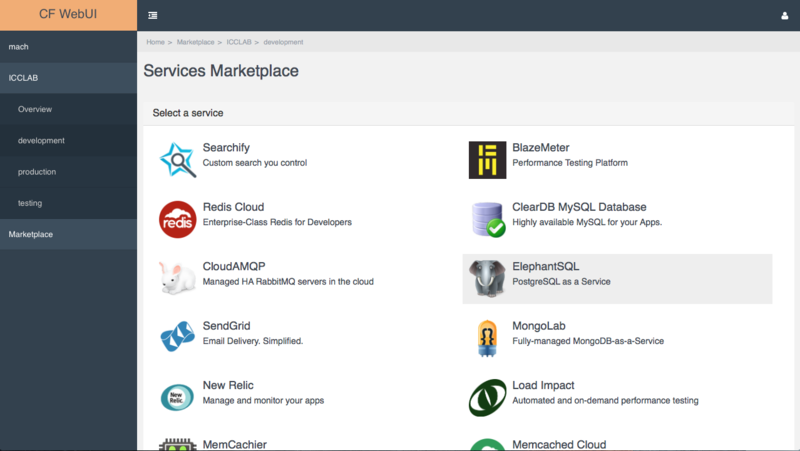 Cloud Foundry is the OpenSource Platform as a Service (PaaS) Framework on which many PaaS offerings are based (e.g. Pivotal Web Services, HP Helion, IBM BlueMix, Swisscom Application Cloud, anynines, etc.). It allows the developers to provide, manage and scale their application in the cloud very easily and quickly. For end-users Cloud Foundry provides a REST based API and a command line interface (CLI) client. No official free and open source web front-end is currently available. 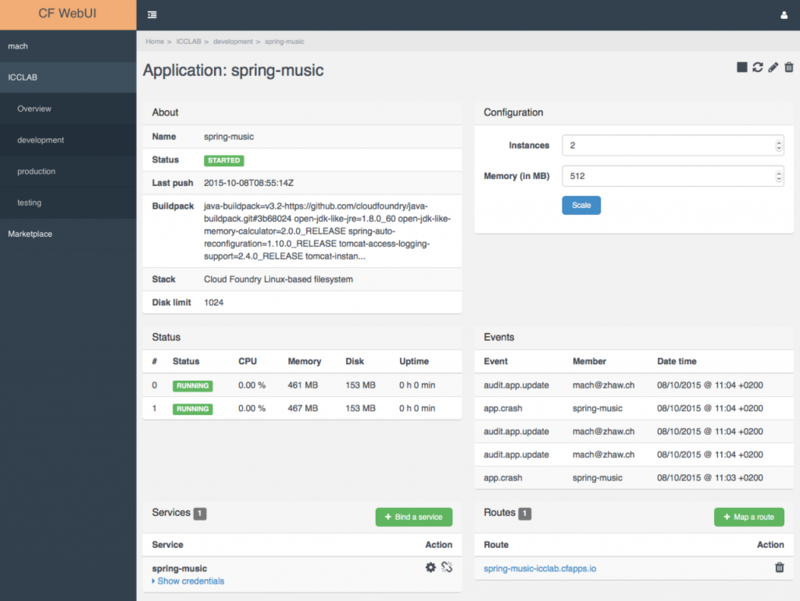 CF WebUI currently implements most of the basic features to manage your applications. We are continuously maintaining and enhancing the product and adding new features. Contributions are always welcome; please check our product page. This entry was posted in *. *, CloudFoundry, Open Source and tagged AngularJS, Cloud Foundry, paas, Web Application by ferd. Bookmark the permalink. Oh very nice work! Thanks for making this! The URL is generated when you push the application. You can check it using ‘cf app cf-webui’. No port needed. The username and password is the same that you will use in the chosen endpoint. If you use Pivotal Web Services, you should use the account from Pivotal Web Services, since this application only provides the interface. the login does not work, Commandline does. Hi, this nginx proxy to itself cause this error. You can deploy your CF to muilt nodes, set the api and app to different haproxy. Hi, I think I have the same problem. I have a standard 14 nodes (api_z1, runner_z1, ha_proxy_z1… ) deployment on OpenStack. Could you explain what I have to do? Same problem over here, is there any progress to report on this issue? This is very cool. Unfortunately, there is no information on populating the Marketplace. Any details on that? Why not a simple upload app and push function? >> SyntaxError: Use of const in strict mode. Warning: Task “default” not found. Use –force to continue. I want to incorporate this tool in my application. But the upcoming features listed above are the primary requirements. Are the deploy feature and monitoring application logs added as a functionality in a further version? Great work. It compiles, runs and I can login easily. Thanks for doing it, waiting for the next releases.